A very important aspect when deciding on a Tutu is the suitability and ‘look’ of it on the dancer. The role it is needed for plays a big part as Classical Ballets have their set styles. Then the height of the dancer often dictates the length of the Classical Tutu skirt. 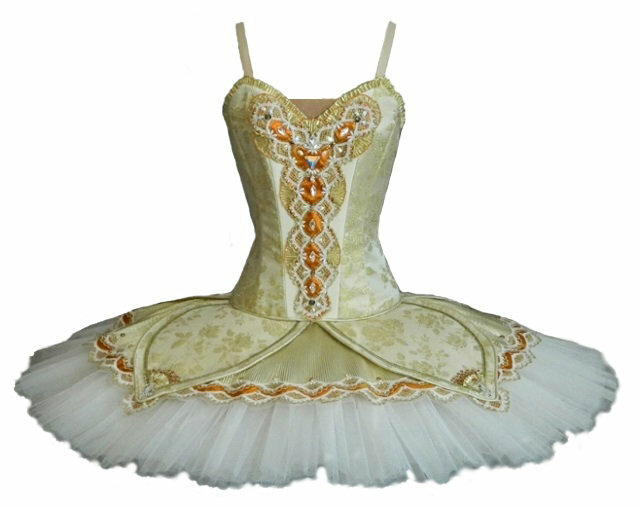 A dancer of 5′ 2″ would not suit a 15″ Tutu, as the proportions would be incorrect. If the Tutu is needed for a competition then the restrictions are less and there is more freedom with style and colour. A Tutu is a large investment and looked after properly and made with the correct fabrics, will last for years. Tutus are often sold on, and in that way some of the investment is recouped. Tutus are engineered and built to exacting specifications. They must fit the dancer correctly and sit firmly anchored to the body. Commitments—I commit myself totally to every Tutu I design and make. It is very important that I feel the same from you. If you are not fully involved in this process you need to re-think your needs, the why and what for? The process in building a Tutu for a specific Body and custom making every detail is time consuming and unique to each customer. If you are not happy with Photos of your Tutu being shown on my Gallery please inform me at the time of your order. I often have restrictions from Customers and will discuss with you any photos I would like to use. Once you have filled in the Form for a ‘Tutu Enquiry’,( found under TUTU on the Menu), I will contact you to discuss your requirements. A quotation is given and is valid for 30 days. When you have decided on your order you then complete the ‘Order Form’ and submit it to me. A Binding contract is on payment of the deposit. I will contact you again to discuss your requirements in more detail. Custom Tutus are made to each dancers unique shape and therefore it is very important to have 2 – 3 fittings to make adjustments . A mock up (Toile) is made after measurements are taken and the Tutu is based on that mock up. You must make yourself available, when necessary, for these fittings at each stage of the manufacture of your Tutu. If unexpectedly unavailable for the taking of measurements, these could be organised by mail, although this is not the best solution. I will send a tape measure and you can download the Measurement Instructions and Forms to complete. If these do not appear to be correct, they may have to be redone. These must be returned within a set time limit or another order will have to take precedence over yours. I travel often for fittings and if necessary I can organise to come to you at a small extra fee (Travelling expenses). This can only be done within one hours driving from my place of work and only where absolutely unavoidable. If this is likely to happen then please let me know at the time of ordering your Tutu. Please read the Terms and Conditions relevant to Custom made Tutus.